This is my basic quinoa pilaf. We eat it as a meal, a side dish, a light post-yoga lunch or a snack. Rinse the quinoa and place in pot with 2 cups of water. Bring to a boil, cover, and reduce to a simmer. 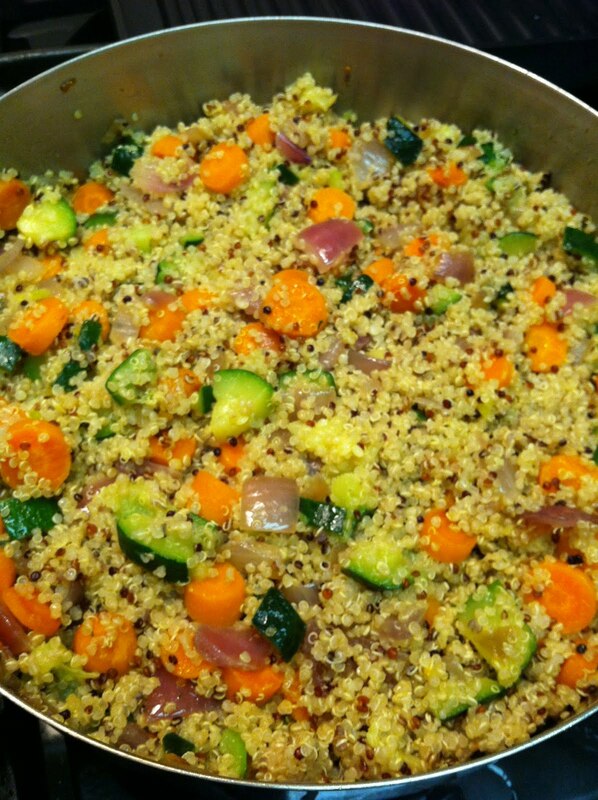 Quinoa is done in 15 to 20 minutes or when all of the water is absorbed. You will see the little curly ends of the quinoa separate. In a pan with sides, saute the onions in olive oil with a dash of salt until translucent, then add carrots. After few minutes, add the zucchini. Cover and let the vegetables cook on medium. When the quinoa is done, pour it into the pot with the vegetables and combine. Enjoy!